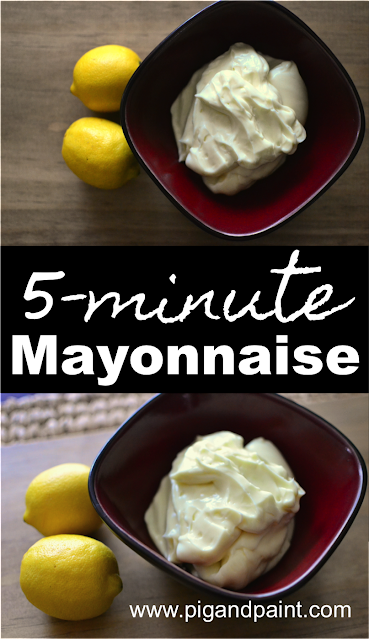 This mayo recipe is the closest I’ve been able to get to a popular store-bought mayo brand (you know, the one with the blue lid and yellow label), yet it’s a thousand times more delicious. I never thought I’d be the girl licking mayo out of a bowl, until I started making my own. It takes about five minutes to whip up a batch (trust me, I timed it), and it’s so much better for you than the stuff you buy in the store. We use it to make salad dressing, dips (it makes a mean ranch dip), on sandwiches, you name it. If you like your mayo on the tangier side, simply double the lemon juice and vinegar. Maybe it’s just me, but the food processor is the only appliance that leaves me with perfectly emulsified mayonnaise. I’ve tried a regular blender, I’ve tried my Vitamix, I’ve tried the stick blender – they all end in a watery mess of a broken emulsion. Apparently, my mayo-skills stop at food processor. If you are one of the lucky ones with the magic touch of mayo-making in any appliance, then rock on with your bad self. I, personally, can only endorse a food processor. Your ingredients MUST be at room temperature. Avocado oil is essential – if you substitute with olive oil, the end product will taste completely different (like a big ol’ creamy glob of olive oil, actually). Just use avocado oil. Trust me. Don’t substitute. Sanity-Saving Tip: Eggs still in the fridge? Bring them to room temperature quickly by placing them in lukewarm water for about 15 minutes. Add all ingredients, except the avocado oil, to the food processor. Turn on the food processor and very slowly begin drizzling in the avocado oil until all of the oil has been added (be patient!). Once all of the oil is added, turn off food processor and enjoy! Store in the fridge.